Kick off your visit on the 7th (Sun): make a splash at Silvestre Resort Thermas Park, then look for gifts at Buriti Shopping Rio Verde, and then buy something for everyone on your list at Shopping Rio Verde. For other places to visit, photos, traveler tips, and other tourist information, read our Rio Verde online holiday planner . The Route module shows you travel options from your home to Rio Verde. Wrap up your sightseeing on the 7th (Sun) early enough to travel to Foz do Iguacu. 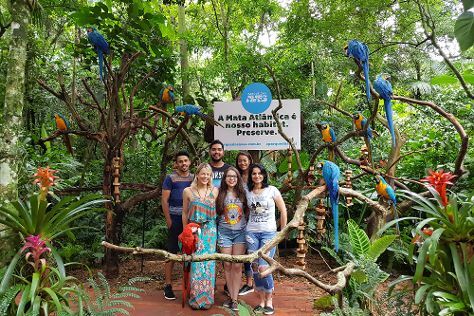 Attractions like Parque das Aves Bird Park and Astronomy Polo Casimiro Montenegro Filho make great kid-friendly stops. Next up on the itinerary: admire the sheer force of Iguazu Falls, snap pictures at Ponte Internacional da Amizade, identify plant and animal life at Bela Vista Ecological Refuge, and see human ingenuity at work at Itaipu Hydroelectric Dam. To see ratings, maps, reviews, and other tourist information, read our Foz do Iguacu trip site . Drive from Rio Verde to Foz do Iguacu in 15 hours. Alternatively, you can fly. Traveling from Rio Verde to Foz do Iguacu, you'll lose 1 hour due to the time zone difference. In July in Foz do Iguacu, expect temperatures between 25°C during the day and 13°C at night. Finish up your sightseeing early on the 13th (Sat) so you can travel to Balneario Camboriu. Kids will enjoy Beto Carrero World and Bombinhas Beach. Go for a jaunt from Balneario Camboriu to Blumenau to see Vila Germanica Park about 1h 15 min away. And it doesn't end there: kick back and relax at Praia das Laranjeiras, stop by Balneario Shopping, pause for some photo ops at Cristo Luz, and stroll through Central Beach. To see where to stay, reviews, maps, and other tourist information, refer to the Balneario Camboriu trip planner . Traveling by combination of flight and bus from Foz do Iguacu to Balneario Camboriu takes 5.5 hours. Alternatively, you can do a combination of flight and shuttle; or drive. In July, daily temperatures in Balneario Camboriu can reach 24°C, while at night they dip to 16°C. You will have some time to spend on the 18th (Thu) before leaving for home.